Implementation of a singleton pattern must satisfy the single instance and global access principles. It requires a mechanism to access the singleton class member without creating a class object and a mechanism to persist the value of class members among class objects. The singleton pattern is implemented by creating a class with a method that creates a new instance of the class if one does not exist. If an instance already exists, it simply returns a reference to that object. Once you have the instance returned by method GET_INSTANCE, you can freely access the public interface (methods/attributes/types, …) of the class. 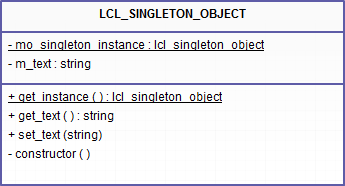 CLASS lcl_singleton_object DEFINITION CREATE PRIVATE. RETURNING value(result) TYPE REF TO lcl_singleton_object. get_text RETURNING value(result) TYPE string. mo_singleton_object TYPE REF TO lcl_singleton_object. IF mo_singleton_object IS NOT BOUND. CREATE OBJECT mo_singleton_object TYPE lcl_singleton_object. m_text = 'Object was created'. WRITE: / 'Object A: ', l_text. WRITE: / 'Object B: ', l_text. lo_obj_a->set_text( 'Text set from object A' ). lo_obj_a->set_text( 'Text set from object B' ). 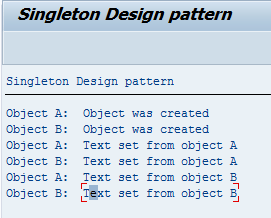 This entry was posted in ABAP, Algorithms, Creational patterns, Design Patterns, Development and tagged ABAP, design patterns, singleton by Spider. Bookmark the permalink.